Those of you who know me probably are well aware that I am not a morning person. But, there were two votes to leave early for Siem Reap, and only one vote to sleep in and leave late. One can’t help but love democracy. Even early in the morning it is hot and humid outside. A shower got me going and then Bridget’s delicious coffee and fresh fruit were further enticements to stay up. Besides, we were walking to the bus depot and didn’t have an abundance of extra time. We traded in our tickets for seat assignments and waited in the hot sun. As the three of us were visiting, an extremely handsome and well-dressed man began a conversation with us. He told us that he was raised in Cambodia, barely escaped the Khmer Rouge, and moved to the US where he eventually became a citizen. He went on to say that among other things that he had done, he was also a writer. We later learned that Golden Bones was his memoir about his life in Cambodia, his escape to Thailand, and move to the US. Once in the US he worked at any number of jobs including driving a cab in New York City, before going on to do graduate work at Columbia University in International Affairs, became a US citizen, and worked in a number of prestigious positions in the US government. For more detailed information about this fascinating person go to http://www.sichansiv.com/ He had come to Cambodia on this trip to have a ceremony at Angkor Wat in honor of his mother. Just as we were having a lovely time visiting, the buses arrived. As Siv wasn’t on our bus we said our goodbyes. The bus was modern, clean and comfortable. I sat next to a local woman so our communication was limited to smiles. The bus trip was about four and a half hours. I enjoyed being out of the city and seeing the rural areas and small villages. We were into the heart of the dry season. The rice paddies had brown short stalks poking up from the dry soil, what was left after the harvest. We passed many schools and it was evident that the schools and school grounds were community centers for the villagers. Small children dressed in variations of their school uniform were walking, trotting or riding a bike with friends or siblings to school. The school grounds appeared to be swept and cared for. Occasionally I would see little tiny boys playing outside of their homes, which usually stood in clusters. These little boys were completely naked and exuded a feeling of the freedom and fun during these romps. I never saw a little girl completely naked. They were always covered by a little dress or shift. 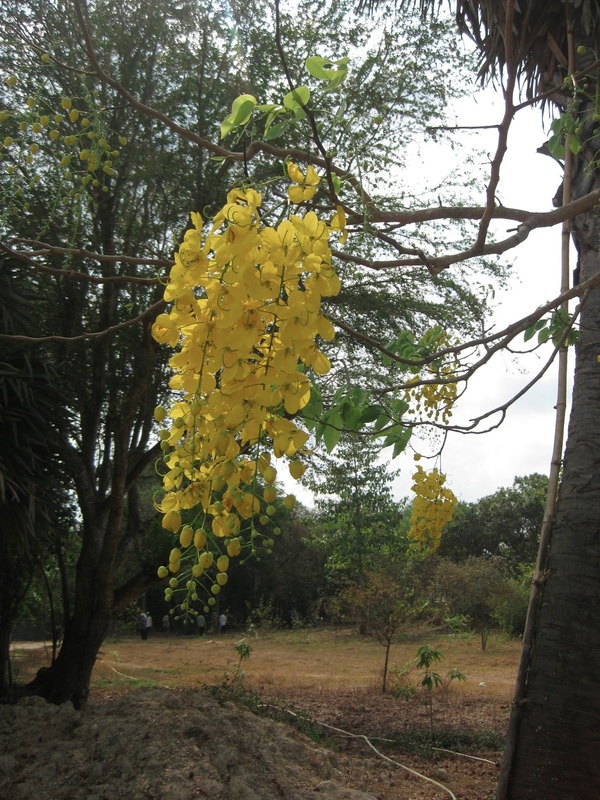 The trees that we passed were loaded with mangoes. Most of them were green still, but I remember that even green mangoes can be delicious depending on how they are prepared. I enjoyed looking at the housing, the villages and little businesses along side the road. We passed a number of spots to sit, to get a drink or something to eat in the areas that were thick with the ubiquitous plastic stools used in SE Asia. 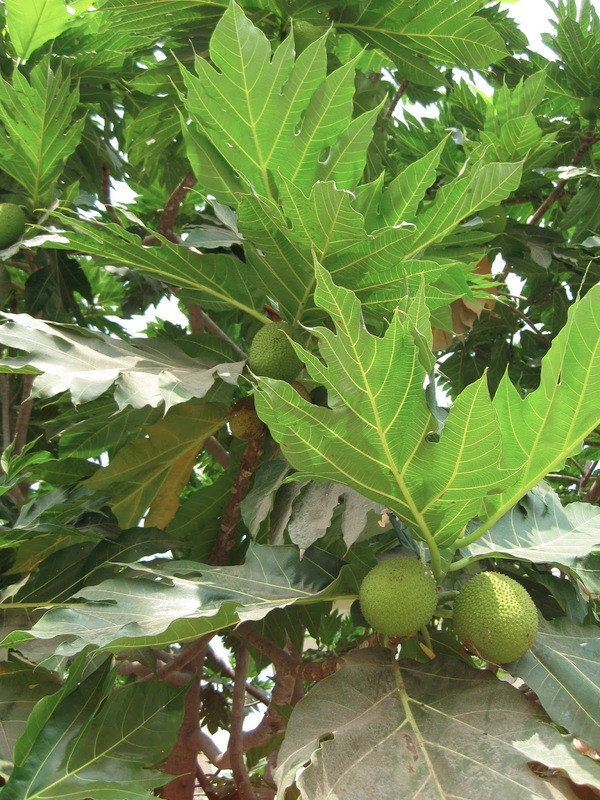 I tried to identify as many fruit trees as possible but saw one that I was not familiar with. I alerted Bridget (who has a degree in Agriculture) and Helen to look and to try to help me discern what kind of fruit grew on those trees. It became an unsolved mystery, but was fun to try. Some people had little ponies to help carry loads or pull carts. Though the ponies were small they looked stocky and strong. They must have also been bred to withstand the tropical climate. After about two hours the bus pulled into what we discovered was a rest stop. It was really a treat to be able to get out and stretch our legs, and traipse through a restaurant to the restroom. While going through the restaurant I spotted the man that we had met in Phnom Penh, Sihan Siv. He came out to the shade in the parking area and joined us a few minutes later. I hinted that it was too bad that we had missed our chance to get a photo with a famous writer in Phnom Penh. He was most happy to pose with each of us for a souvenir photo and to share more delightful conversation. Coincidentally his wife is also a librarian! While resting in the parking lot I couldn’t help but notice a monk walking under one of the shady trees. 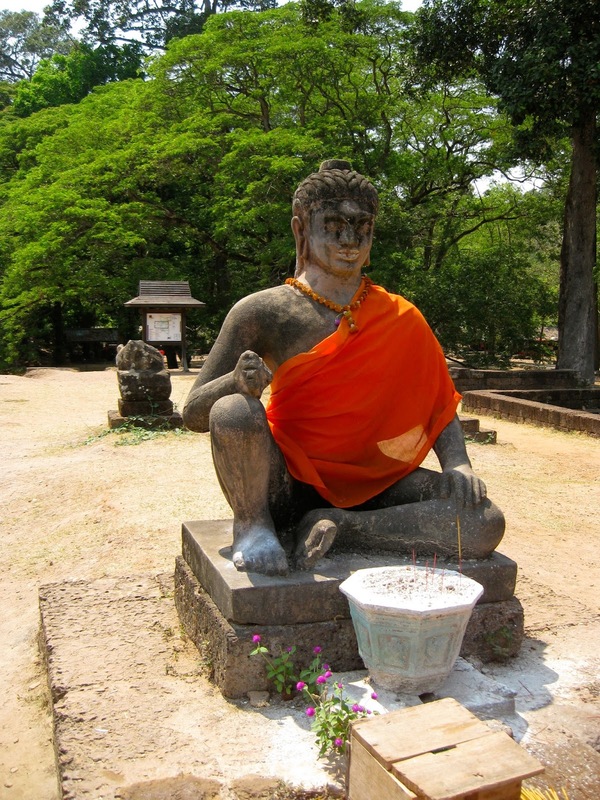 When I think of a monk I normally picture a serene and peaceful person communing with nature. 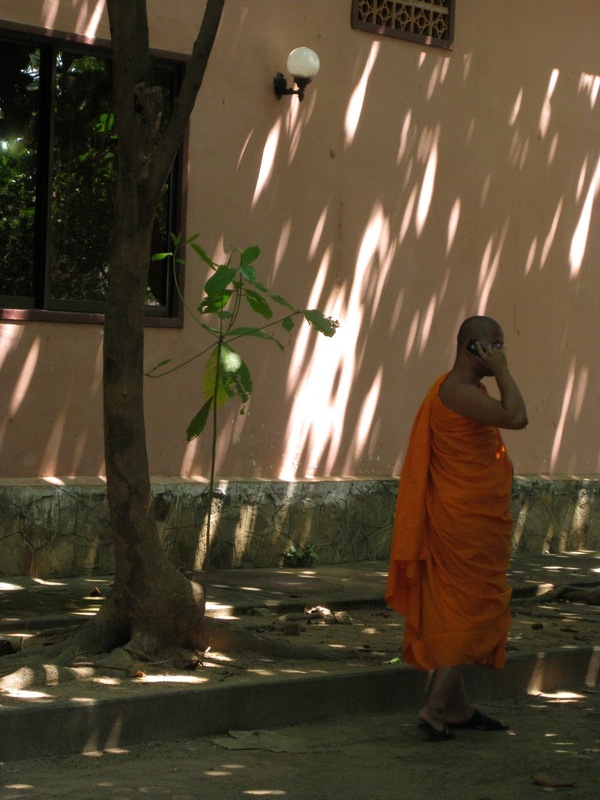 This monk surprised us all as he was smoking and talking on his cell phone. Later we thought “why not!” This is the twenty-first century after all. The next two hours took us very gradually uphill and into Siem Reap. This city was even more bustling and busy than Phnom Penh. And, it was certainly hotter! I had thought that as we were going slightly uphill on our route that it might be cooler at our destination. Just the opposite! We got off the bus, retrieved our bags and followed Bridget who had secured a tuk tuk and driver for us. The three of us and all of our luggage somehow fit on the tuk tuk despite my worry that my big bag would slide into traffic as we turned corners. We made it to our lodging without incident however. We had reservations at the Golden Banana, but little did we know that there are now five Golden Banana resorts. At least they are all in the same area but It took a bit of doing to figure out where each of us should be, but after some shuffling of bags and lodgings we managed to obtain room keys. The room that Helen and I booked had an upstairs and a downstairs.That was agreeable since it gave us each a bit more privacy. It seemed a bit odd, but the bathroom was upstairs. The staircase to the bathroom was unbelievably steep...and the rickety handrail didn’t fill us with too much confidence. Helen, who personified kindness, gave me the upstairs room. I think that she felt it could be hazardous for me to be going up and down stairs in the dark. We had a pleasant balcony which overlooked a very pretty garden and the pool. I think that the first thing that we did was ditch our suitcases and then went to the restaurant for lunch. That was the only time that the food was just “O.K.” The biggest challenge was sharing the patio with all of the Europeans who were smoking some beastly smelling cigarettes, or even worse, just letting them smolder in ash trays. We have become so accustomed to No Smoking areas that to be exposed to the heat and smoke on top of my fatigue left me with a slight feeling of nausea. It didn’t take long after that to shower, change clothes and get a tuk tuk,which were lined up outside of our lodging, to Bar Street. Lured by the wonderful shops, great restaurants and the possibility of new experiences we were driven forward despite our early rising In Phnom Penh. We had dinner at a restaurant that had Cambodian dancers who performed during dinner. The costumes, stories and poses reminded me very much of Indonesian dancers that I had seen in the past. The performance was really enjoyable up to a point. I cannot understand why some parents think that it is so darling to have their children stand in front of the stage and imitate the dancers. Furthermore why it has become acceptable to stand in front of the audience to take photos is more than I can understand. With the huge cameras that these inconsiderate people were carrying it doesn’t speak well of their ability to use the telephoto lens that they are equipped with. Despite the annoyances of the tour group mentality, the pitcher of drinks that we shared added some fun to the evening. I contacted the driver who had brought us to our hotel and arranged to have him be our guide for the next three days. 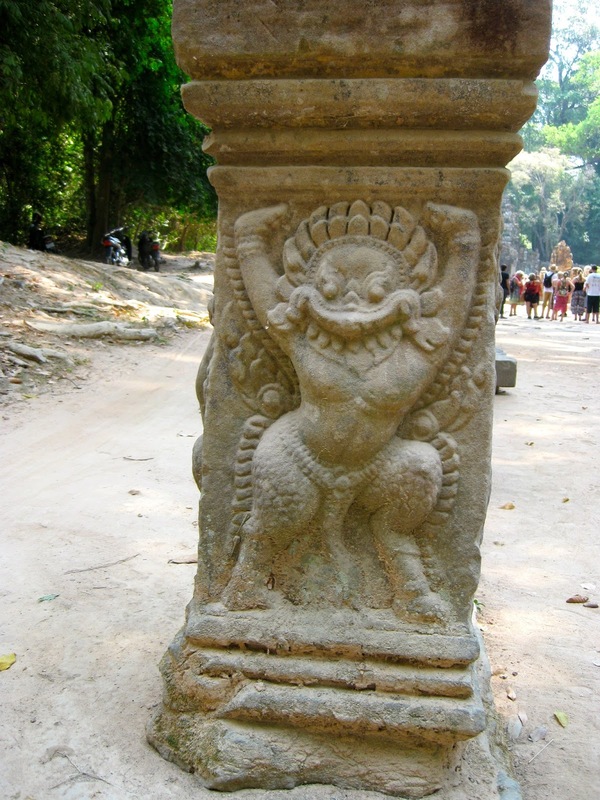 To get a little better understanding of the area I will insert a link to the Angkor Archaeological Site of Angkorian and Pre-Angkorian temple ruins http://www.canbypublications.com/siemreap/srtemples.htm To put this into perspective on another level this link shows the ruins in the Angkor Archeological Park. 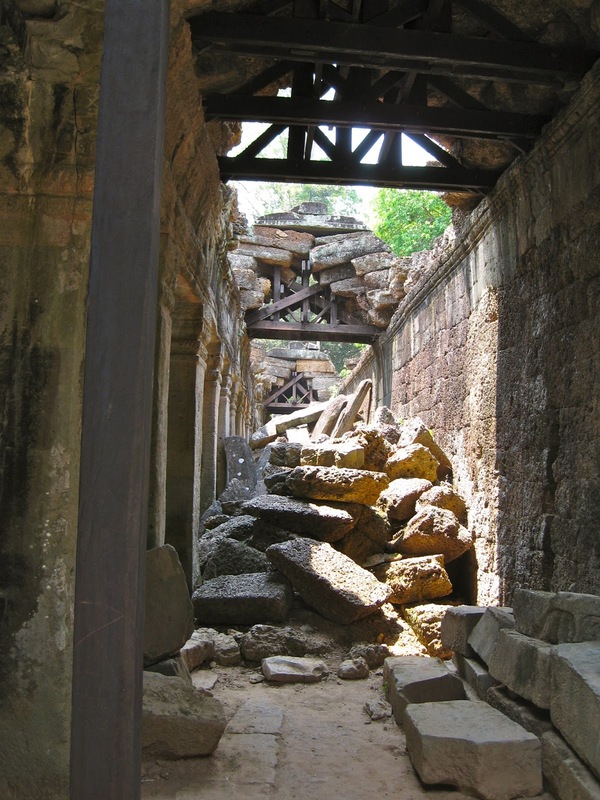 There are many more ruins outside of the park, some of which are accessible by tuk tuk, while others are further away and require a car or bus to cover the distance. After a large and delicious breakfast (included) of bacon, eggs, croissants, fresh fruit and coffee we putted off to Angkor Wat. Our driver was prompt and very kind, listening to our ideas and helping us to form a plan for the day. Bridget had been to Siem Reap recently so she stayed back to enjoy the pool and do some grading that she had brought with her. It was a beautiful drive out to the site, the moat and the picturesque dramatic temple rose up in front of us for us to marvel at this truly breathtaking site. As we walked across the moat we were approached by a man dressed in guide gear. He asked if we wanted a guide and we had already decided that we did, after reading recommendations of hiring one in our guide books. What the books didn’t tell us is that there are plenty of guides and it might well be worth shopping for one. We had just begun the tour when he got a call from his children’s school asking whether or not his children had milk allergies. For some reason this conversation grew and grew as we waited, drinking water and feeling uncertain about what to do next. The guide was a definite low point in our day. If I asked a question he acted slightly annoyed that I had interrupted his robotic recitation of the tour talk. He told us a few facts, all of which one can discover in a guide book. My suggestion would be to skip the guide but read ahead about the area so that one can understand what they are looking at. 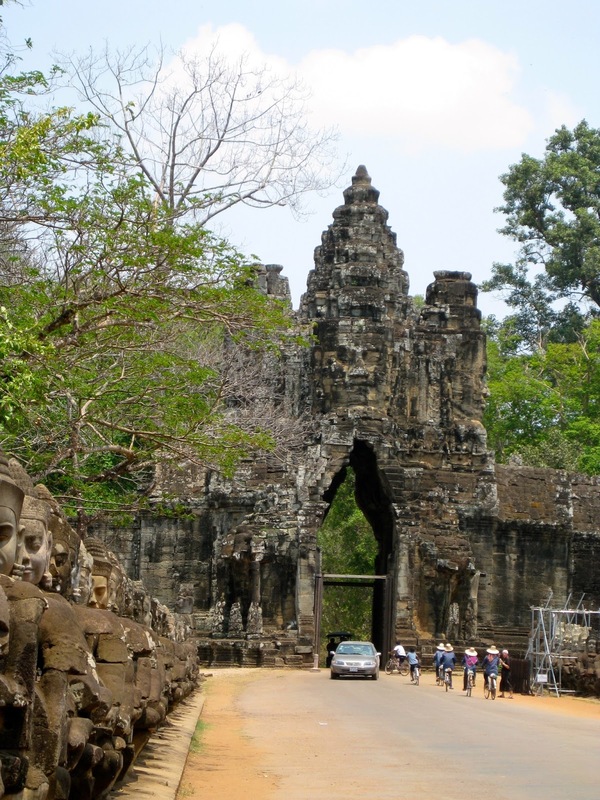 There were three very high entrances into the grounds of Angkor Wat. 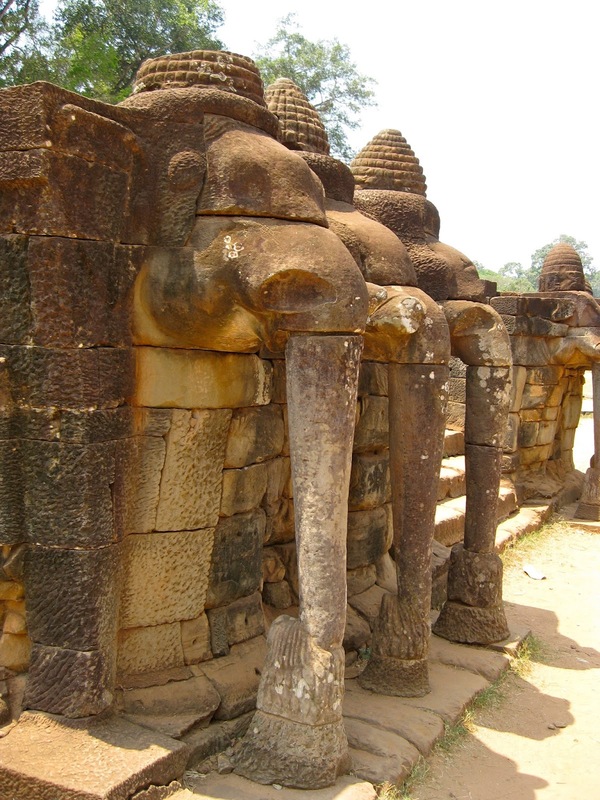 One was to be used only by the royal family, another for the subjects, and the third for the elephants who virtually carried all of the materials that built this lovely site. Joined by the throngs of people who had come to admire this wonder I spotted one of the teachers who also works at KIS in the elementary school. (Later we passed him in town where he and his fiancee were enjoying 50 cent beers!). After our tour we wandered beyond the far side of the temple enjoying the shade trees and the lack of crowds, soaking in the majestic beauty of temple and the park-like grounds. We eventually found our driver and he took us to a few more temples. There were so many temples that we toured that the memories of them blurred as if to become one collective conglomeration of outer temples. These were built over many centuries starting at the middle of the eighth century and continuing until the mid-fifteenth century. Each ruler wanted to leave his legacy in his own domain. Helen wanted to return at sunrise the next morning. I’ve already shared my thoughts on waking early but agreed that it might be worth seeing. I don’t remember what time we arose, only because I am probably still trying to block it out, but we met our driver in the dark and joined the procession of tuk tuks, walkers and bicycle riders who were going out of the town to Angkor Wat. Our driver kindly gave us a flashlight and we ventured through the humid, cloaking air across the bridge, over the moat to the first gates of the temple. The environs were swarming with tourists from all over the world and we wove our way towards the reflection ponds, and past the libraries to the temple. I was greatly appreciative of the flashlight as we passed through the gates because it was very dark and boards were placed at odd intervals on their sides as small thresholds. The light of morning was just dawning as we made our way to the front. I kept trying to appreciate the wonder of the scene before me, inwardly debating whether it may have been just as lovely at sunset? When it seemed that the land was waking up, and what we had come to see had happened we started to walk away. But just then the sky lit up with beautiful colors and made the trip worth every minute to have come during the early hours. We spent the morning and early afternoon visiting some of the most famous temple sites. 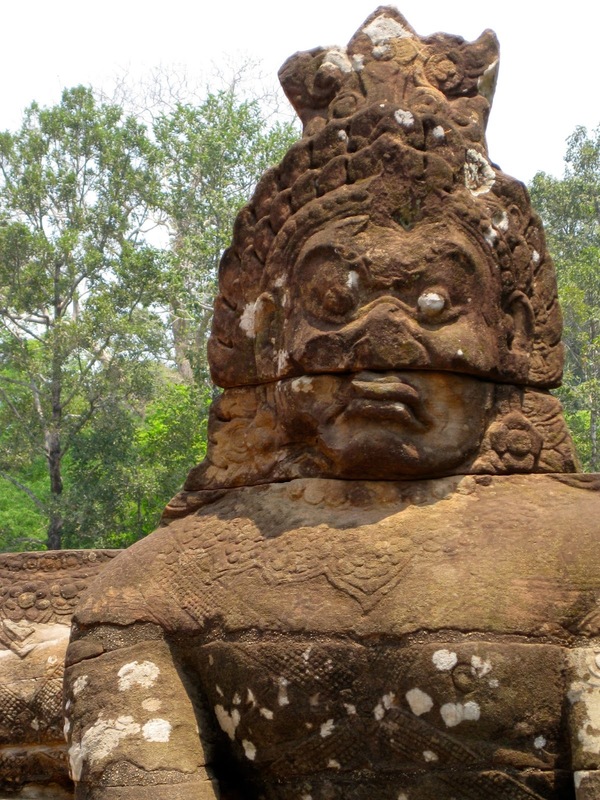 The most unique temple was Angkor Tom which is famous for the many faces carved into the rocks. By early afternoon it felt like we had been on a temple marathon. We returned to our lodging and enjoyed the sunshine, and the pool with Bridget. That evening we went back to the main shopping area, had dinner at a delicious restaurant, where I tried a local specialty, duck. After dinner we wandered through the shops and market place until we could go no more! 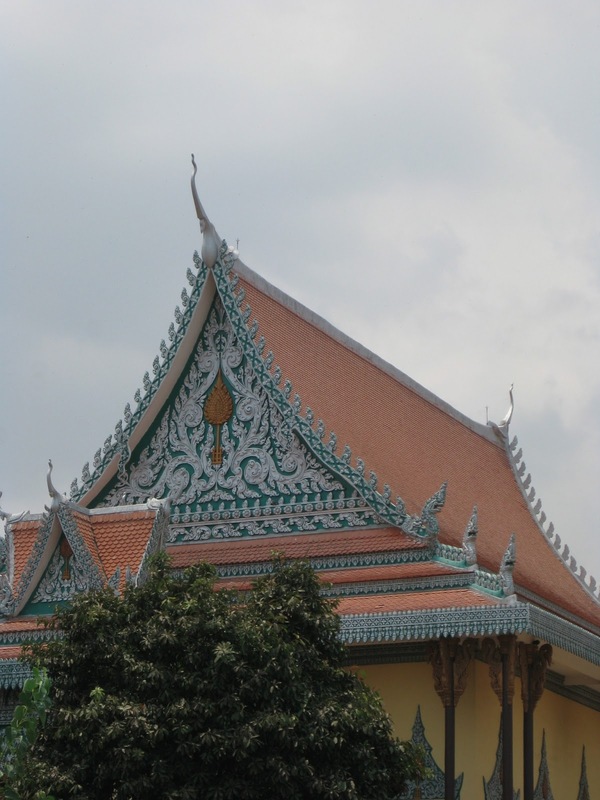 On the third day Bridget had to return to Phnom Penh to teach. She got up at the crack of dawn with us to wish us well and to say our goodbyes, since I was returning to Seoul from Siem Reap. I hugged Bridget and wondered when our paths would cross again. In the early dawn we returned via tuk tuk to see more temples. We also saw what was nicknamed the Indiana Jones Temple. 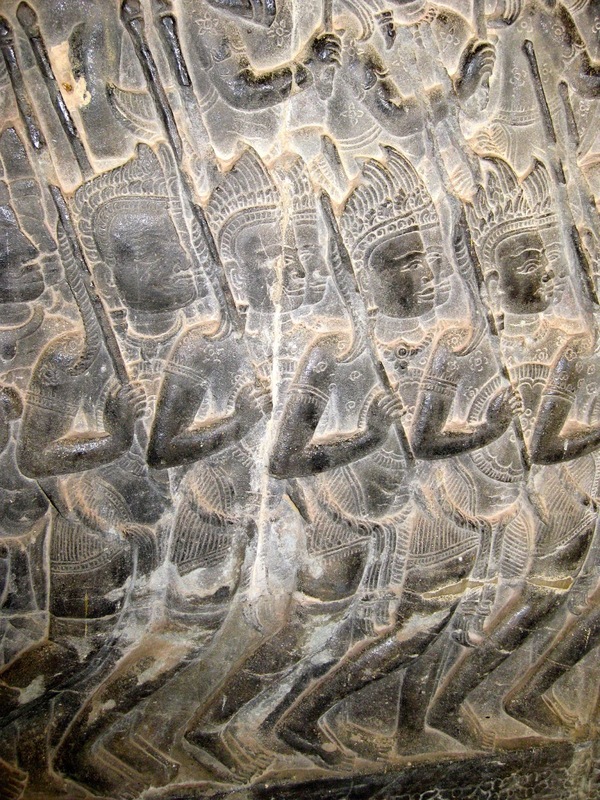 Banteay Srei, “Citadel of Women” was carved from pink limestone giving it a very warm, inviting glow. The carvings here were particularly lovely. This is where my back-up battery in my camera fizzed, so I have no photos of this lovely temple. We had planned another marathon day of visiting temples so decided to go further afield. We thought that we might see less people the further away we were from the central area, but the opposite was true. Parking lots with rows and rows of large tour buses greeted us. Tourists streamed out of them and through the gates like ants on their way to a picnic. What a mob scene...touring at its worst in the 105+ degree weather with people pushing from behind, and young women posing amidst the antiquities for their husbands as if they were doing “glam” photo shoots. Phew! Too much! We found our driver and he took us to lunch under one of the many tented areas around the parks that serves meals. The food was cooked in the open air, and was plain fare but tasted great. We didn’t get sick so I think that speaks well of those places, having eaten there every day. We were definitely a captive audience since there were no other places to go to. Almost all of the meals were about $5 USD which is interesting. The owners knew that we had no where else to go. One could have a very nice meal in Siem Reap or Phnom Penh in a beautiful restaurant for the same price. That day we decided to end our touring at around 1 o’clock ...soaked with sweat and weary. It had been 107 the day before and felt about the same that day. Most of the temples looked as if one might lean against one pillar that everything would topple over. My photos may reflect that feeling. 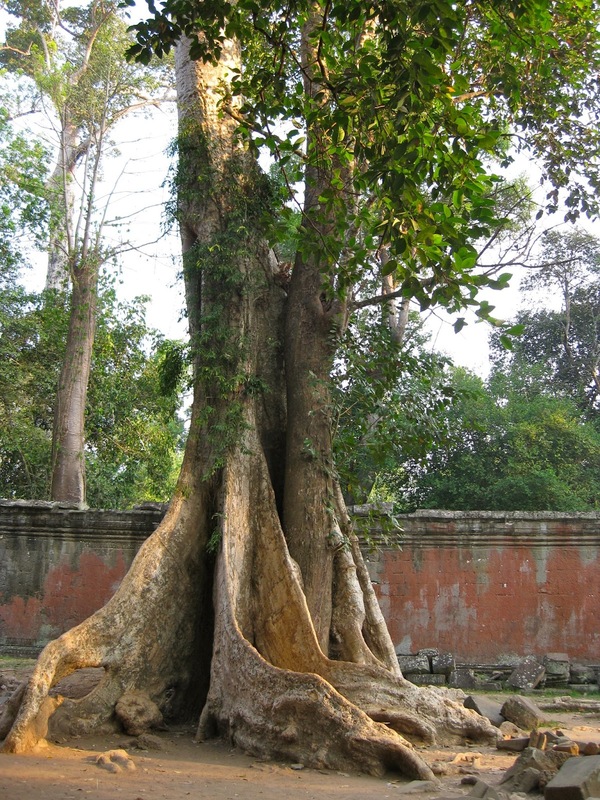 Tae Keo was unfinished because it had been struck by lightning during its construction. The ruler of that region believed that it meant this was a bad omen so abandoned it. On our way back we saw a small butterfly farm and stopped to check it out. We had a wonderful personal tour, saw many beautiful butterflies, and learning many things about how to propagate butterflies. There were also a variety of flowers in the garden that the butterflies especially liked. Looking at plants and butterflies was such an enjoyable way to spend some time in the shade. Unfortunately with no working camera battery my memories must remain in my head. Helen and I spent the afternoon at the pool and returned to the bar street area for a really delicious Indian dinner. We did some more shopping and then went back to our room to pack up. 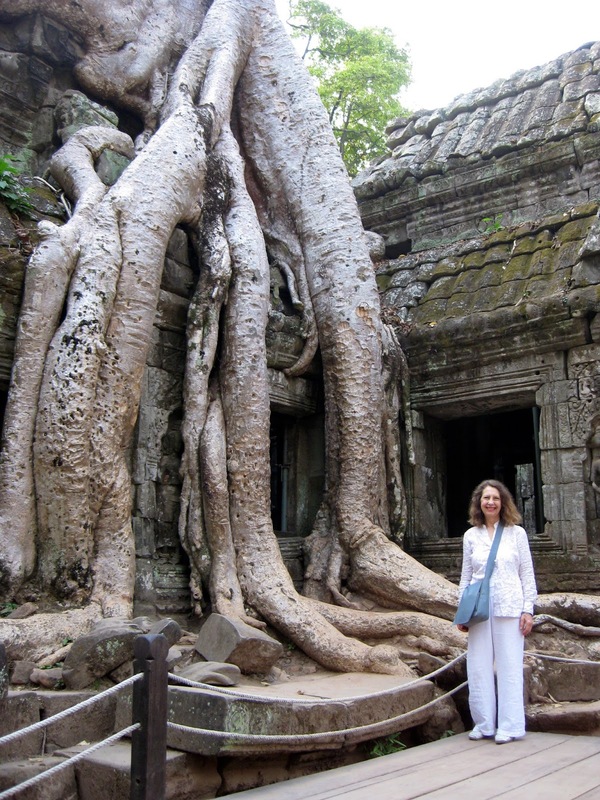 Helen was returning to Phnom Penh the next day and I was leaving on a night flight. Our driver came back to pick me up for my flight from Siem Reap back to Seoul. The driver headed into and through the Bar Street traffic and then away from it. The trip out to the airport seemed quite long. As we had arrived in Siem Reap by bus I hadn’t realized how far away the airport was from the town. I was further astounded by the enormous, sprawling hotels, one after another for miles, on both sides of the street that led to the airport. Large motor coaches were parked in row after row in front of these behemoth hotels. 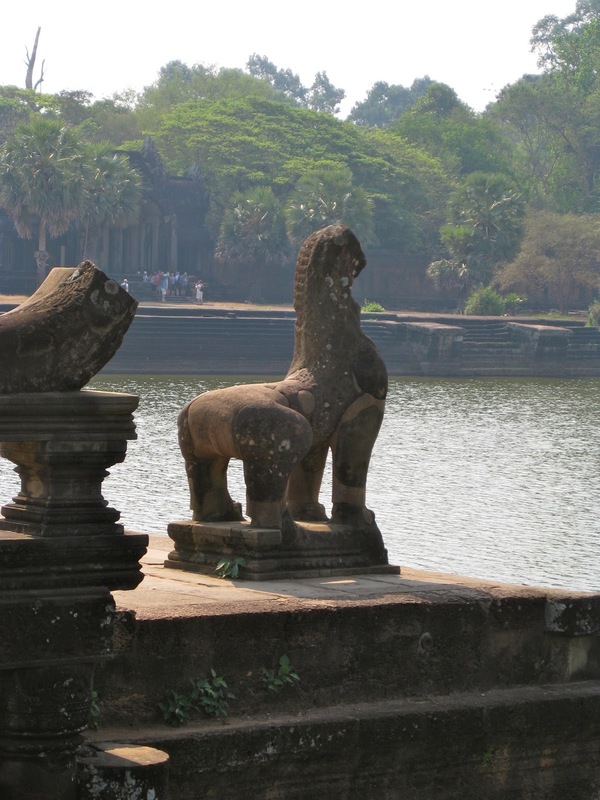 I was glad that I had been spared that sight of Siem Reap during my stay there. It felt over-opulent, especially when one thinks about this county that doesn’t have free education for children, social security for senior citizens, nor health care. The breeze of the night air felt good as it whipped at my hair. The black darkness seemed to coat everything, punctuated only by lights in the distance, growing larger as we got closer to the airport. I felt sad to leave the driver who had been so patient with us, had endless bottles of cold water in a cooler at the ready, and who had shared details about his life and family with us. It is a wondrous thing to have good people who come in and out of our lives. I also thought of Sarom, our driver in Phnom Penh. Maybe we will never see these people again, but they will be like glowing lights in the world. It is a treasure just to have memories of the many people whose paths cross with ours as we travel through our journey of life. I checked in and talked to some very nice people from the US. We enjoyed sharing talk about favorite books for awhile and then it was time to board. The plane was not very crowded which surprised me. I think that almost every flight that I have been on in the last three years has either been at, or almost at, capacity. Imagine my delight when the boarding door was closed and I had the seat next to me empty. I was able to rest and relax a bit on this night flight. Normally I would avoid a night flight at all costs but the only other options were flights that made either two or three stops and had hours of waiting padded into the total travel time. Early in the morning I arrived to the gray and cold weather in Korea. Reluctantly but rapidly I got my down coat out of my carry-on bag and went outside to join the other somber faces, waiting for the bus to take me back to Bundang. I saw Helen a few days later on the school bus. She pulled a book out of her bag which was a signed copy of Golden Bones by Sichan Siv! She had run into him in the airport in Phnom Pehn where he was signing books. Being the very generous person that she is, Helen let me borrow her copy and read it even before she had the chance to read it. 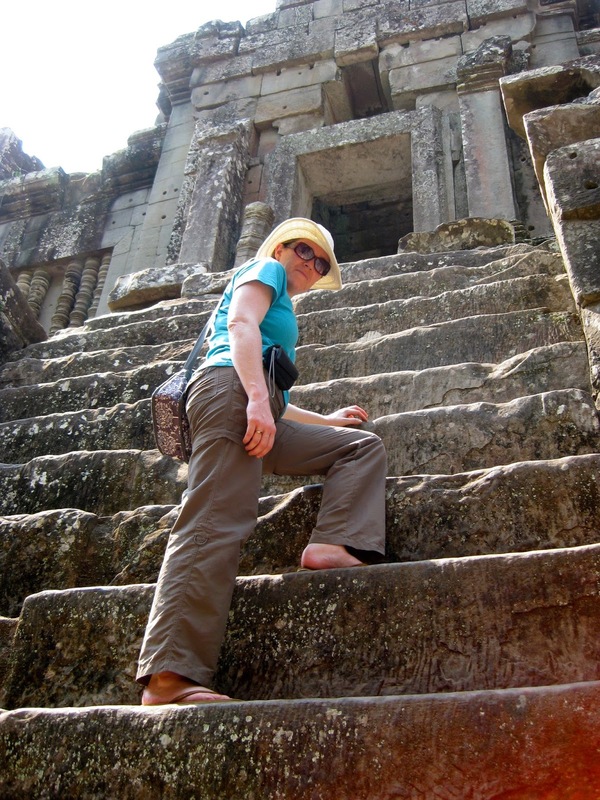 As I journeyed through Siv’s memories I thought about Cambodia and its people, and how they had been changed so drastically by their recent history. I learned so much and had such a wonderful trip. I met people who I might never see again, and yet they gave of themselves through kind acts, friendship and generosity. Though I will never forget the splendor of Angkor Wat, it is the Cambodian people who I met that will leave their indelible prints on my memory. 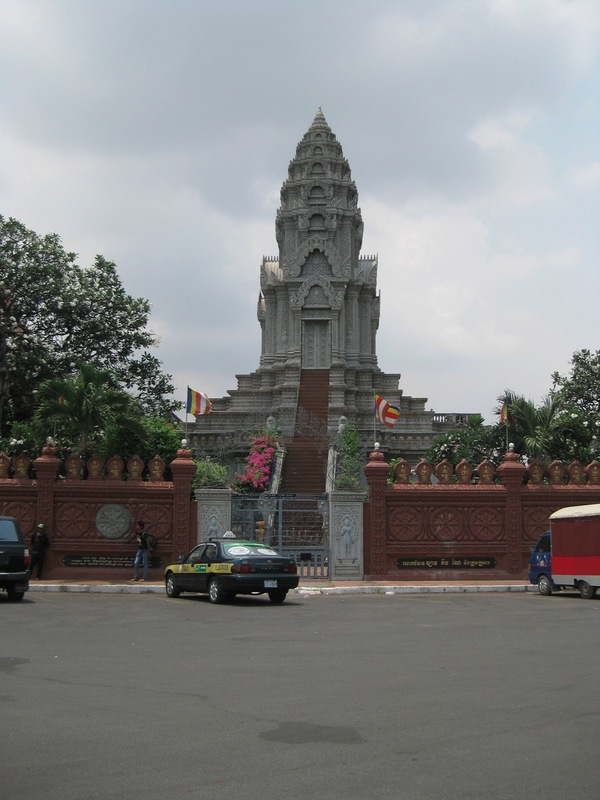 Going to Cambodia - Best Tuk Tuk Driver in Phnom Penh! One of the great things about working overseas is that when friends move on to schools in other countries it is wonderful opportunity to visit these friends and discover new horizons. When my friend and co-worker, Bridget, moved to Phnom Penh I told her that I would come visit her in the coming fall over Chusok Holiday, which falls either in September or October depending on the year. Summer vacation took me back to Seattle, then to Portland, Sacramento and back to Portland, to Disneyland and then back to Portland and Seattle again. I returned to Seoul for a few days before I flew to Chengdu where I met Tessa and Adam, and we went to see the pandas. Next we flew to Shanghai for a week before returning to Seoul together. It was blistering hot in Seoul and we mostly dodged into buildings for a bit of air conditioning or waited in long lines for cold drinks. School began again the first week of August. I was worn out from traveling so I wrote to Bridget and apologized for my situation, promising that I would make the trip six months later, over Spring Break. For an inexplicable reason I became preoccupied with safety in Cambodia. I had heard a few stories of travelers who had problems and I began to think that I best be prepared. I had gotten a passport holder that I could wear around my neck, and rummaged through my drawers until I found my fanny pack. Someone suggested that since we were taking cash, (Cambodia uses the USD in addition to their riel), that we stash it into several different locations. I had booked my trip to leave on Friday night after school let out. Normally I would never to do that as I prefer a little down time to rest, organize and pack before I leave. However, Bridget’s time off for spring break didn’t coincide with mine so if I wanted to see her I needed to get there at the beginning of the weekend. Happily another teacher friend of mine, Helen, came along. When school let out we jumped on the school bus, and confirmed with each other that we had exactly twenty minutes before we were to meet in the lobby. I flew into my twenty-third floor apartment, threw down my school bags and ran Ruby out to the fourth floor patio where dogs can relieve themselves. As I stepped back into the elevator I was getting that feeling that I always have when leaving Ruby. Ruby’s dogsitter was going to stay with her all week, who she adores, but I always feel a lingering sorrow at leaving Ruby. I stuffed my school bags into cupboards since there is a guarantee that Ruby will chew up absolutely anything that is left out (nicknamed the result “Ruby Chew”. I wonder if Jimmy Choo fans would appreciate this?). I got my suitcase and my backpack, met Helen and walked the short distance to the airport bus stop. I had only been on the bus for about 5 minutes when she asked if I had the hotel voucher for Siem Reap. I got out my plastic folder to show it to her that I had them, but much to my chagrin realized that my visa documents were not in the folder. Helen told me to be calm and to look through everything. I already knew that if they weren’t in the folder they weren’t there. When we got to the airport, Helen, who is extremely resourceful, suggested that we find a business lounge so that we could reprint the documents. As it turned out there were no printers available. We did check my hotmail account to see if I could retrieve my visa number, but damn! Hotmail had blocked my visa information and the only access I had to it was from a document that I had saved on the desktop of my computer that I’d left at home. Luckily the visa was only about $25 so I decided that I would just have to buy another one when we arrived at the airport in Phnom Penh. (The whole purpose of getting the visa beforehand was to avoid the wait in the visa line upon arrival!). The flight was non-stop and only about five hours, so we had time to relax. The sky was very beautiful as we got nearer Cambodia, ablaze with stars. I was enchanted by the clear night and was even more pleased when I saw a falling star. Only then did I realize that I don’t think I have ever seen a star in Seoul. Granted, I do go to bed quite early, but I think the area that I live in is far too bright, and too polluted, to be able to see stars. As we descended the sky became more hazy, but I could see Phnom Penh in the distance. I was extremely surprised to see what a village feel the locale around the airport had. Neat, straight roads were dimly lit and I could see the grid pattern of the area. After deplaning I explained to a man at the visa desk that I had forgotten my visa so would need to get a new one. He told me to go to customs and tell them. I did and the young man at the desk looked very angry and shook a threatening finger at me telling me to go back and pay. I said in a mouse-like voice that I was told to come to this desk. He yelled at me again. Inspiration made me ask if he could access the visa by my passport number. He looked at me with contempt, but entered the number into his computer. Before I knew it he was printing and noisily stapling documents into my passport. I apologized for being so much trouble and got a weak smile from him. I had worried about finding Bridget, which turned out to be a ridiculous worry for two reasons. The first is that Bridget is a blonde and stands out easily in a crowd of Asians. The second reason is that the airport was about the same size as the airport in Saipan...tiny! We saw Bridget’s smiling face and waving arms and ran to give hugs all around. She took us into the inky, humid night to wait for her Tuk Tuk driver to circle around and pick us up. 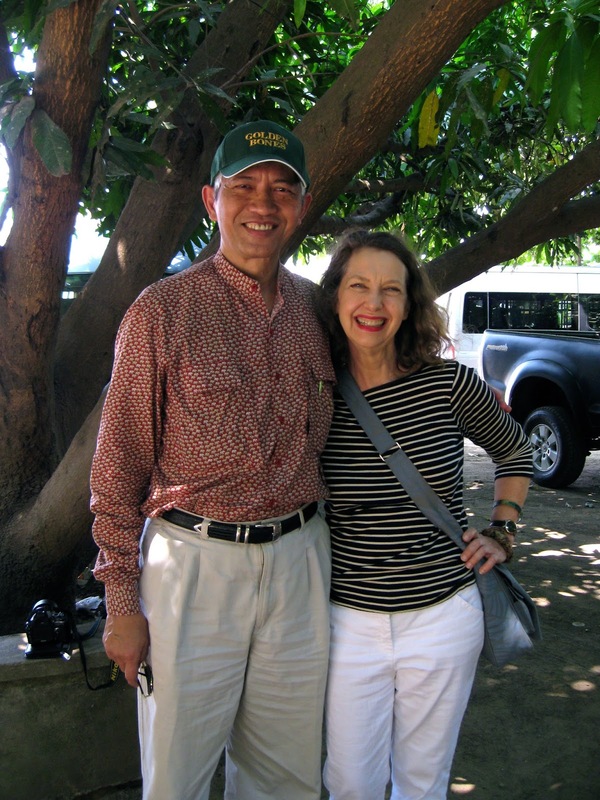 I was immediately charmed by Sarom the moment that Helen and I met him. We packed our bags into the little open air trailer, climbed onto the seats, pulled by his motorcycle and off we went. The night air and the happy conversation were pleasant and reviving as we were now at 1:30 AM by our Seoul time zone, although was only 11:30 PM in Phnom Penh. We arrived in a lively neighborhood that was still busy at this time of night. Before we climbed the flights of stairs to Bridget’s apartment we stopped at the “Panda Mart” to get some snacks and drinks. I opted for two beers! I was ready to start my vacation. Bridget’s apartment was fantastic. 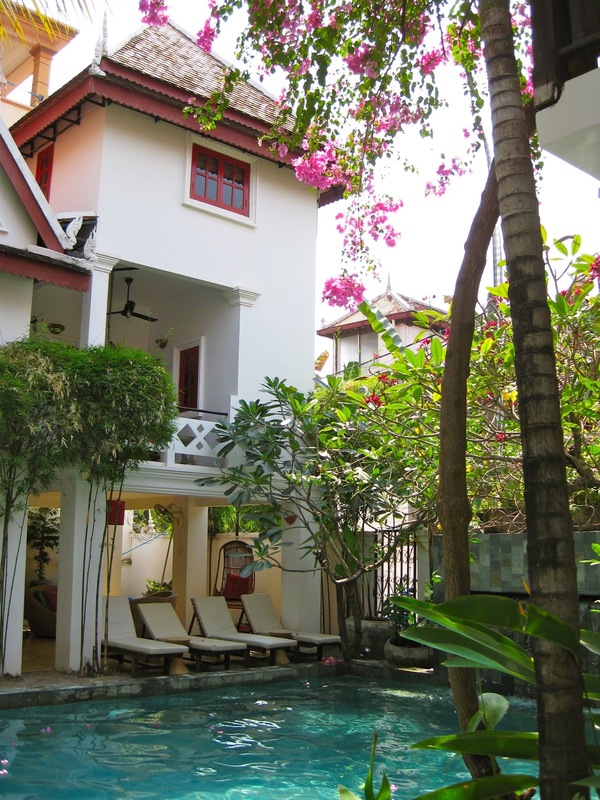 It was an old style colonial design with modern updates, high ceilings, a balcony and plenty of space. The living room had a large corner sectional covered with exquisite silk pillows in a myriad of vivid colors. It didn’t take long before we looked at the clock which told us that it was 2:30 AM! (4:30 AM Seoul time). We headed to bed and agreed to rise quite early so as to take advantage of every moment! just around the corner I took a few photos with my camera. The colors, and the hum of street life in the neighborhood were enticing. After we showered and dressed we said our “good mornings” to Bridget’s neighbor walked just around the corner to some wonderful shops. It wasn’t long at all until I had purchased some beautiful leather dress shoes, and had my eye on some some wallhangings and jewelry at another gallery filled with lovely curios made in Cambodia. As we meandered from shop to shop we stepped into shops with lovely silks and beautiful locally made goods. Anyone who has ever done any serious shopping knows that one can really develop an appetite from the exertion. 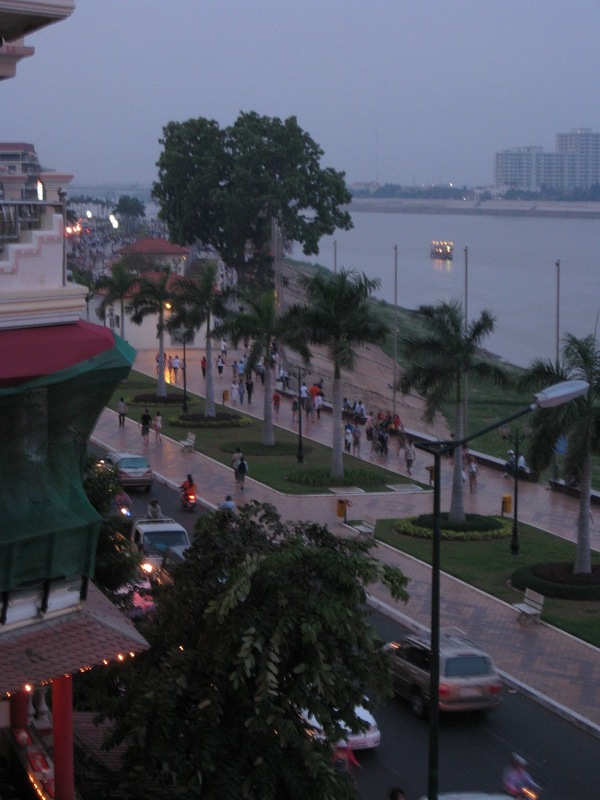 We went to a restaurant that overlooked the Tonle Sap River, merging into the Mekong River. 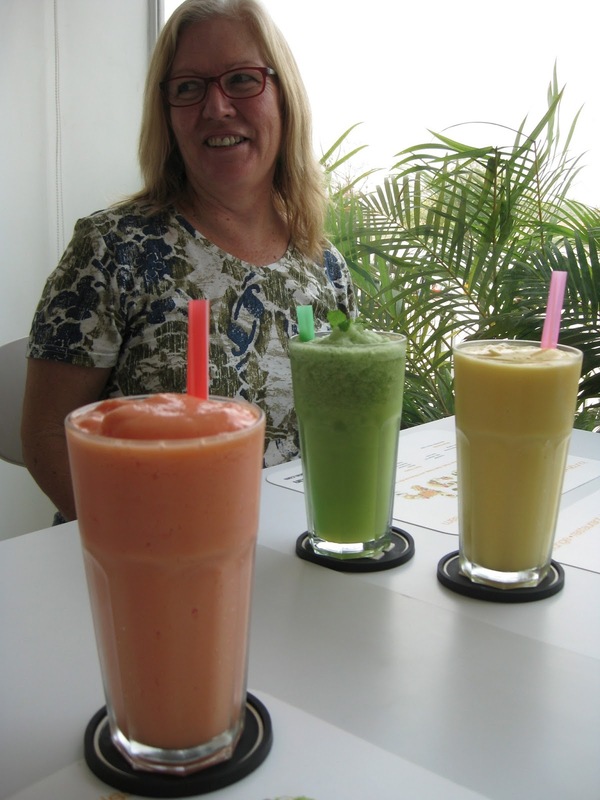 We all ordered fresh fruit smoothies and some local dishes. I enjoyed a local specialty called Fish Amok, which is the national dish of Cambodia. The flavors were delicate and light. Cambodian food is mild in flavor, unlike food from its neighboring country, Thailand which is known for their hot and spicy flavors. After wending our way through a few more specialty shops we decided to return to Bridget’s via the Palace, which is in her neighborhood. It was so hot that we almost melted! Even in the heat the fuchsia colored blossoms of the bougainvillea were an oasis of color and shade. Before returning to Bridget’s we couldn’t resist the temptation of stopping in just a few more shops. Helen went ahead to look for a scarf that she had seen that morning. To her disappointment it was gone. It took me all of 2 seconds to make a beeline back to that store to see if the wall hanging that I liked was still there. It was, so with relief, and the joy of obtaining something special, of course I bought it. We stopped by the Foreign Correspondents Club for a pitcher of mohitos and a wonderful view of the merging rivers. 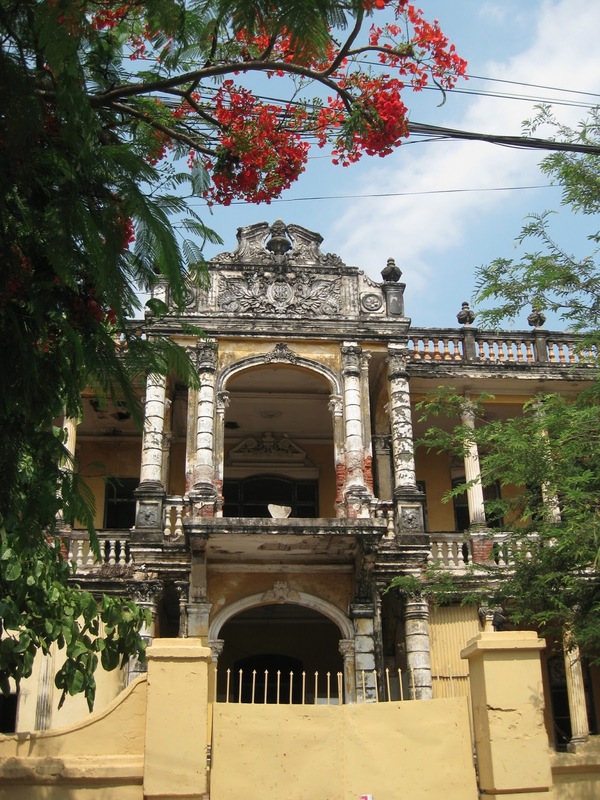 This three-story colonial style building became very famous during the Vietnam War years since it was the most popular hang out for journalists at that time. The building looked as if it was from a colonial era film. A wooden bar, heavy pillars, ceiling fans and photographs on the walls made me want to come for the afternoon to visit with people or simply read poetry. We watched people strolling along the waterfront and watched many boats traveling on the misty river. That evening Bridget took us to a French restaurant of colonial style, which was a perfect blend of elegance and relaxation.. After having eaten so much Korean food or whatever western food I am able to cobble together in Korea, the prospect of French food was tantalizing. The menu offered a wide variety of dishes. The food was delicious, and made me wish that I could move to Phnom Penh without delay! 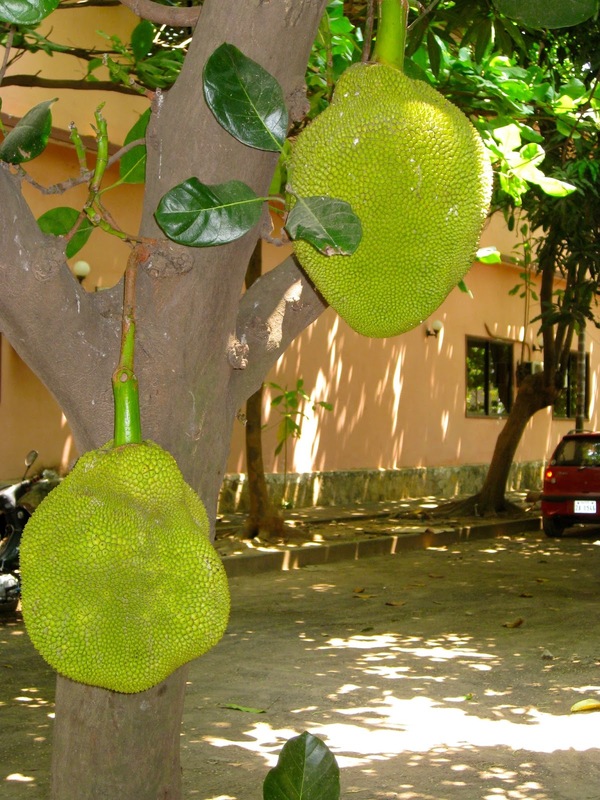 The climate was so enjoyable, the people so warm and friendly, and there was an abundance of wonderful fruits and vegetables which added color and texture to the city scenes! The next morning we were up early again! Sarom was taking Helen and me to see The Killing Fields and the Tuol Sleng Genocide Museum, formerly called Security Prison-21, during the Khmer Rouge regime from 1975 to 1979. To get there we drove through the heart of Phnom Penh. It was a bustling crowded city with cars, tuk tuk’s and motorcycle weaving around one another and pedestrians. I became very appreciative of Sarom’s excellent driving skills as he expertly avoided all obstacles including pot holes on the road. It was a bit dusty driving through the city but was a pleasure to enjoy the breeze and see the street life unfolding before us. 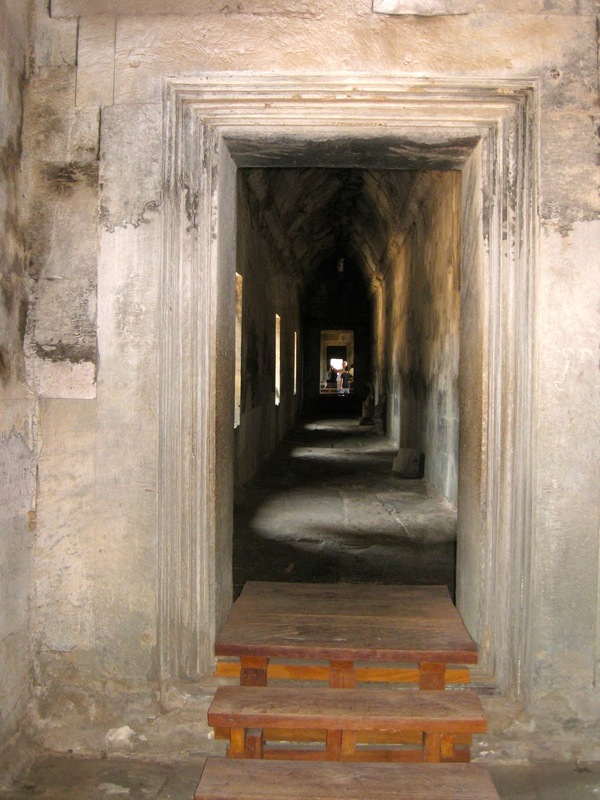 Helen and I talked about Cambodian history and realized that we didn’t know very much about it. I think that this is a good very way to learn. When motivated by my interest and curiosity I look up facts and peruse maps to understand what has happened in the past, the history of a place. 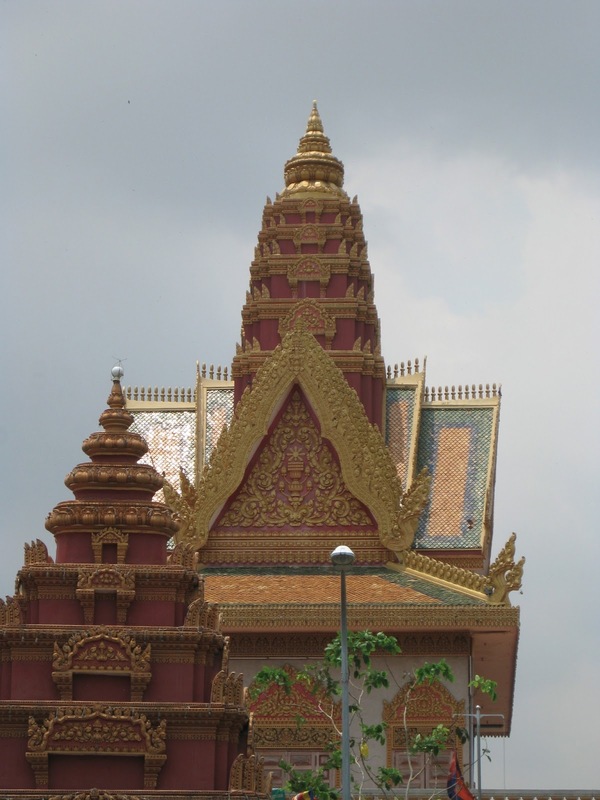 When I returned home I was very interested in reading a number of books about Cambodia in the 20th century. 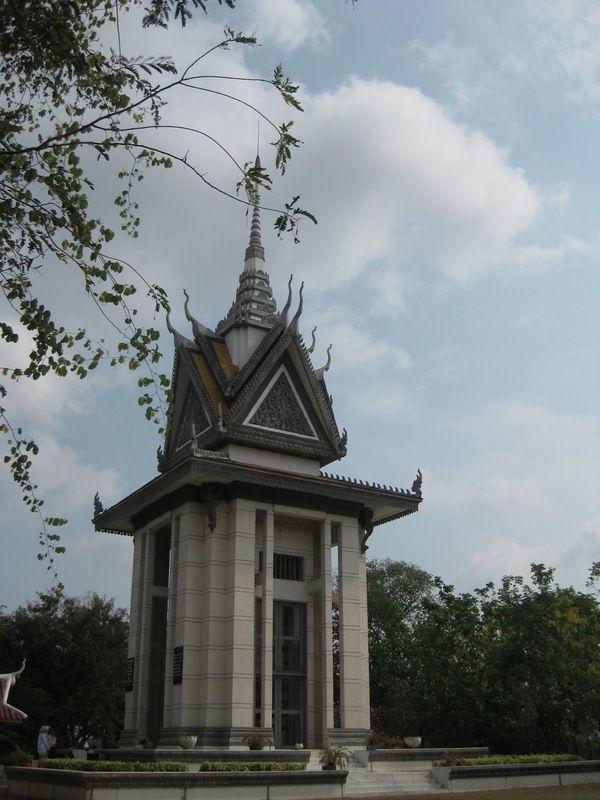 We arrived at The Killing Fields where there was an unusual feeling of quiet and stillness. We were able to rent headsets which were indispensable for understanding the history and events that occurred here. There were actually many areas that were called Killing Fields throughout Cambodia. Tragically Pol Pot’s regime was responsible for executing almost one and a half million Cambodian citizens who, because of their education and or political interests were considered to be political threats to the regime. It is believe that upwards of two and a half million Cambodians died from 1975 to 1979 was a result of execution, starvation and disease. As we moved through this area that nowadays resembles a park, it wasn’t difficult to spot bone fragments mixed into the soil that we walked on. 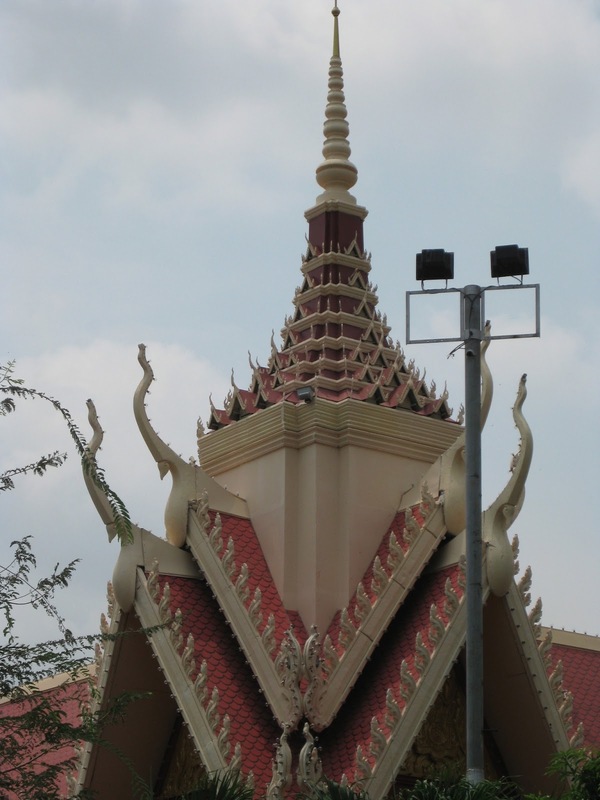 There was a stupa erected on this site which contains the bones of many of the victims. Feeling profoundly sad we returned to Sarom and his Tuk Tuk which was waiting for us. We found some cold drinks and enjoying the comfort and shade of the Tuk Tuk engaged in a very pleasant conversation with Sarom about his family, his relatives and his life in Cambodia. He came from the countryside to work in Phnom Penh some years ago and has worked his way up to become the number one tour guide and driver in the city! While we talked and asked questions about his life, there were a number of small children who gathered around us asking for or demanding “a dollar, or “coke.” It was hard to resist their demands, but I held firm since the present thought is that it is not good for the children to develop begging as a way of life. For the old people it is viewed rather differently, since they receive no social security compensation. Next Sarom took us from the periphery of the city back into it’s heart. We went to Tuol Sleng Genocide Museum where many young students and other people had been horrifically tortured and killed. As we walked through the former school, then site of torture, and now a museum it was a bitter walk. Moving from dusty classroom to classroom, which had been turned into sites of torture, were horrific. Next we saw displays of some of the victim’s photographs, bits of clothing and instruments of torture. It was a tragic example of man’s inhumanity to man. I felt no ghosts there, for who, even among the dead would desire to linger there even for a moment? 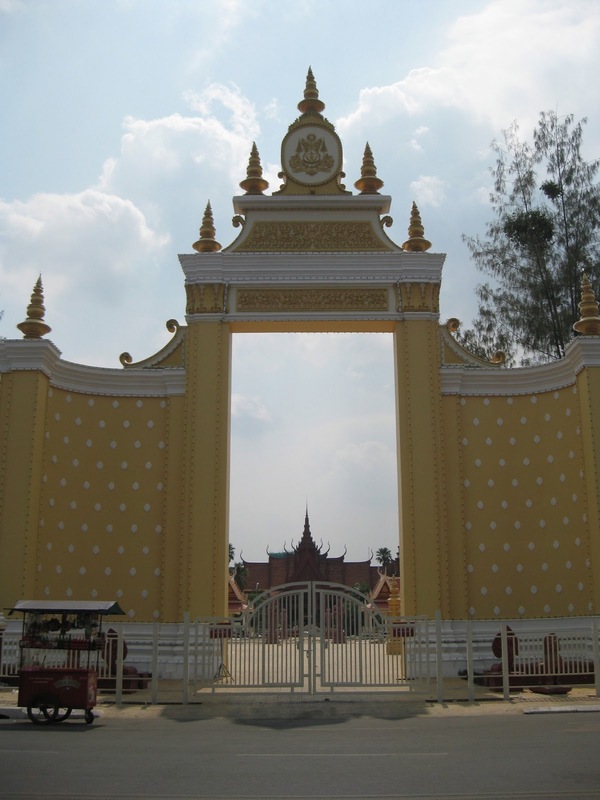 I felt like I was shaking off a dark shadow as we passed through the gates and found Sarom. Greeted by Sarom’s winning smile we boarded the tuk tuk and he took us back to Bridget’s home. She had stayed behind to grade papers. After we showered and cooled off Bridget tooks us across the street to a terrific restaurant called Friends. It was so popular that we had to wait awhile, so we opted to wait in their gift shop. What was unique about the shop was that every item was made of recycled materials. The restaurant is well known for providing job training and jobs for former homeless and marginalized young people since 1994. The food was delicious and the restaurant provided a cool retreat for reenergizing ourselves. As we were eating we noticed many tasty looking desserts being served. Of course, despite being rather full from our meals we each ordered a yummy dessert as well! Now fully revived we ventured forth again into the midday heat. We forged ahead to see more sights and to explore more of the ever tempting shops. Purses, paintings, jewelry, clothing and yards of gorgeous silk fabric seemed to be everywhere. Sarom was, once again, a wonderful guide and took us to many neighborhoods that had various specialties. We didn’t realize that the stores closed so early on Sunday nights so that only meant that we had to accelerate our schedule. You would have thought that Shop till we Drop had become our new motto. Happily Helen was able to locate a green scarf just like the one she had missed out on earlier. One of my favorite shops was a clothing store that reminded me of some of the lovely stores that I have been to in London and Paris. I found a beautiful blouse for my soon to arrive granddaughter and some very pretty and airy clothes for myself. I did get a bit of kidding about buying a size four blouse for an infant, but those of you know know how big the babies are in our family know that probably means that the baby will be wearing the blouse at around eighteen months! My most interesting find was a vintage dress from the mid 1970’s. It reminded me of one that I had years ago that had been a favorite of mine. It was in perfect condition and cost only about eight US dollars. Finally when the last of the shops extinguished their lights we adjourned to a nearby bar. A tall cold beer sounded very enticing to me, but after reading the menu there was only one local beer available on tap. After waiting a rather long time the waiter brought us a sample of a very unremarkable beer. It didn’t pass the taste test so we opted for cool drinks instead. Unanimously we agreed that we were still full from lunch so passed on the thought of dinner. We wanted to get back to Bridget’s to pack all of our new treasures so that we would be ready for a very early bus ride to Seam Reap the next morning. Bridget was able to take a few personal days and so we were quite pleased that she was going along with us for more fun and adventure.